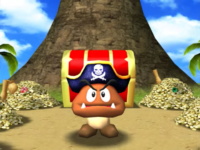 Captain Goomba is an oversized Goomba who wears a pirate hat and appears as a non-playable character in Mario Party 8. He appears at the end of Goomba's Booty Boardwalk and gives players a free Star if they reach him. As his name implies, he is a captain of a ship and has a few Pirate Goombas serving under him. This is a little bit different in Star Battle Arena. In this mode, he still gives characters a star, though it costs 50 coins. Whoever gets the star from him first before their opponent does wins. However, if a player arrive with less than 50 coins, Captain Goomba will let them roll a Coin Block in a Coin Block Area for a chance of winning 1, 5, or 10 coins. After that, he tells his crew of Pirate Goombas to take them back to the start using a cannon. Captain Goomba is the leader of a crew of Pirate Goombas, which are Goombas with green pirate bandannas. They appear on a Green Space. If a player lands on their Green space, the three Goombas will exclaim that "landlubbers" are not allowed to meet their captain and are only worthy to be cannon fodder. Upon saying this, the Pirate Goombas immediately surround the character, load them into the cannon, and blast the player back to start. This page was last edited on November 28, 2018, at 01:09.